Manufactured in Chine from 0 until 0. 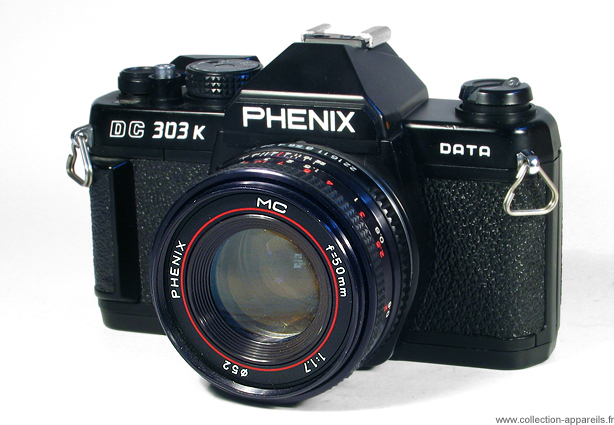 Phoenix DC303K Data was an attractive reflex camera by its tight price and the compatibility of its bayonet (Pentax K which undoubtedly owes him K in its name) with very a comprehensive range of lenses. It made of it an ideal companion of a first camera body more refined, the more so as in spite of its price, it did not skimp over the performances like the speed of the shutter. It reaches the 1/2000. This camera was also sold in Europe by Carena, under the S2000 denomination. Data means that it is equipped with a dating back. Under the same name, Phoenix started again in 2005, a new version with a different design, modernized a little. It cost then, in Great Britain, less than 90 Pounds Sterling. and also Widepan T140 II, panoramic camera.